TMS Ambassador Coral Taylor loves the outdoors, snowboarding, bikes of all types (her dirt jumper is the most fun! 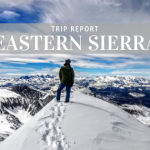 ), hiking, camping, and exploring the Sierras with friends and family. She is also passionate about yoga, and enjoys teaching it. She is also an ambassador for the Tahoe Mountain Bike Girls team, and enjoys shredding the trails of Truckee/Tahoe with a group of amazing women. 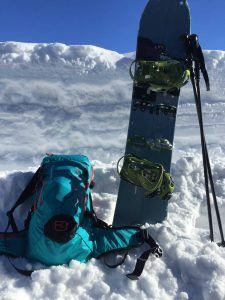 *Where – I have been looking for a backcountry pack to take with me on split boarding missions. 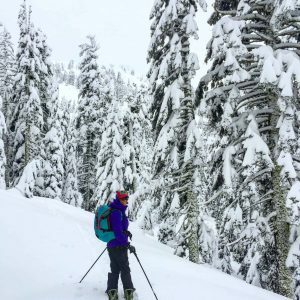 This search was half-hearted last year, but after attending the 2016 SAFE AS Clinic at Squaw Valley in December and seeing the forecast for a big winter, I re-engaged my mindset for backcountry travel, and decided to finally pull the trigger on getting a pack. Since getting the Ortovox Tour Rider 28 S, I have used it for backcountry split boarding near Tamarack Peak, Castle Peak, and Donner Summit. 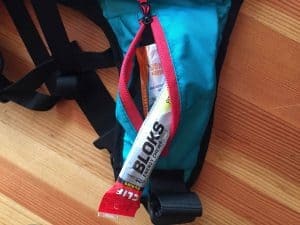 I have taken this pack on short 2-3 hour excursions, as well as longer, full-day trips. I have also used this pack for a weekend trip to the Lost Trail Lodge, which was home base for all day adventures around Cold Stream Canyon. 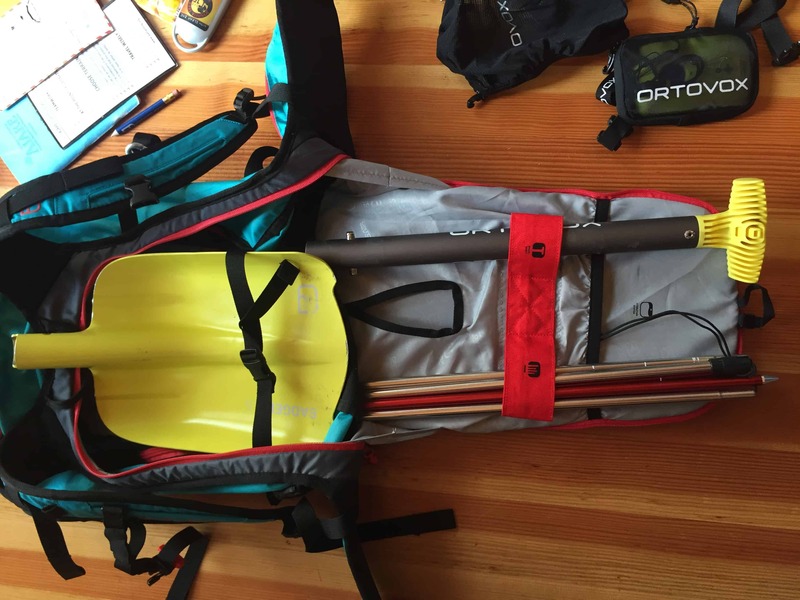 For short trips, the Ortovox Tour Rider 28 S has room for all of my essential gear, and then some. I tend to bring a lot of layers and food, so it’s nice to have ample space to easily get my belongings in and out of this pack. 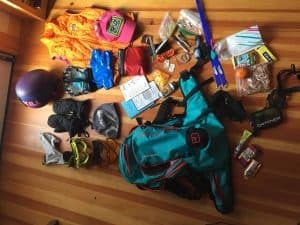 When skinning out to the Lost Trail Lodge (4 miles from the trail head), I had this pack filled with food, a few toiletries, and extra clothing, and there was plenty of room. I was even able to bring my slippers, which is ALWAYS a nice touch at the end of a long day in the snow! J The extra weight wasn’t that comfortable (is it ever? ), but the foam back helped make it a little more manageable. If I were traveling to a more rustic hut, which would have required bringing sleeping and cooking gear, this pack would be too small, but for a couple nights of glamping, it was perfect. 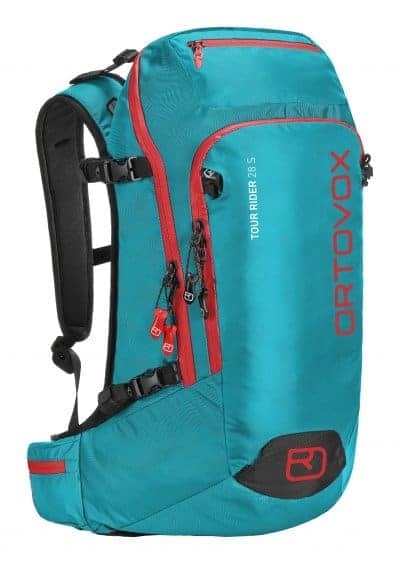 Initially, the most apparent feature of the Ortovox Tour Rider 28 S is the vibrant color. 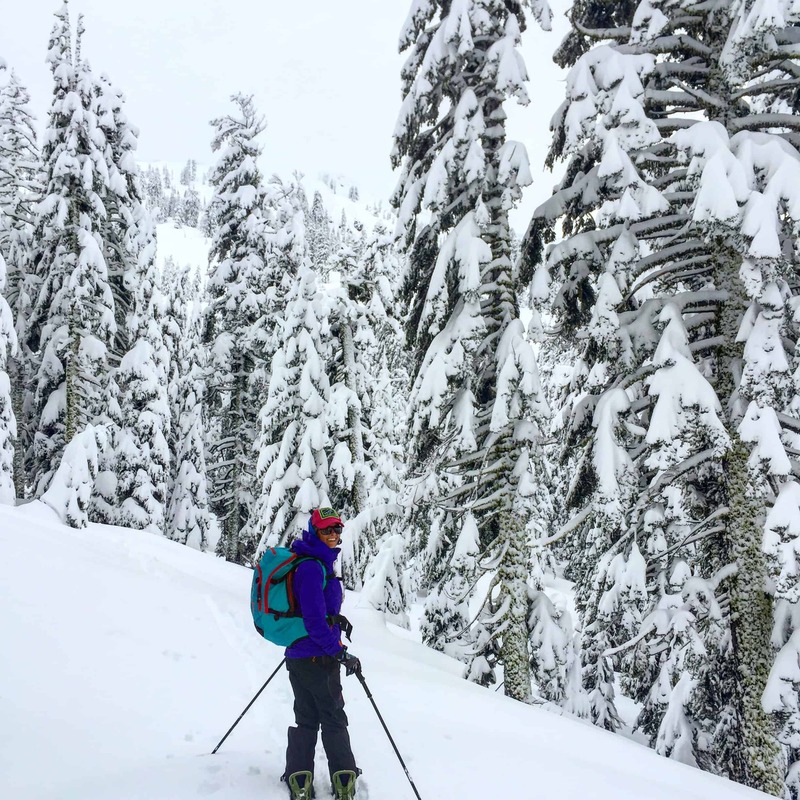 In general, I like bright colors, but I am especially a fan of being seen in the backcountry. 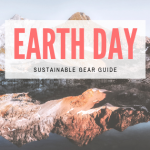 I loved the fact that there is a separate space for my shovel handle and probe, and that the rear zipper allows easy access to this relevant safety equipment – this was a necessary feature for me when shopping for a pack. I am also a giant fan of zippered pockets in the hip straps, and am stoked that the Ortovox Tour Rider 28 S incorporated this feature. Sometimes I start bonking suddenly, and having quick access to snacks is a life saver that allows me to keep trudging along the skin track without slowing down the group…or getting hungry and grouchy! Zippered hip pockets – key to my heart! 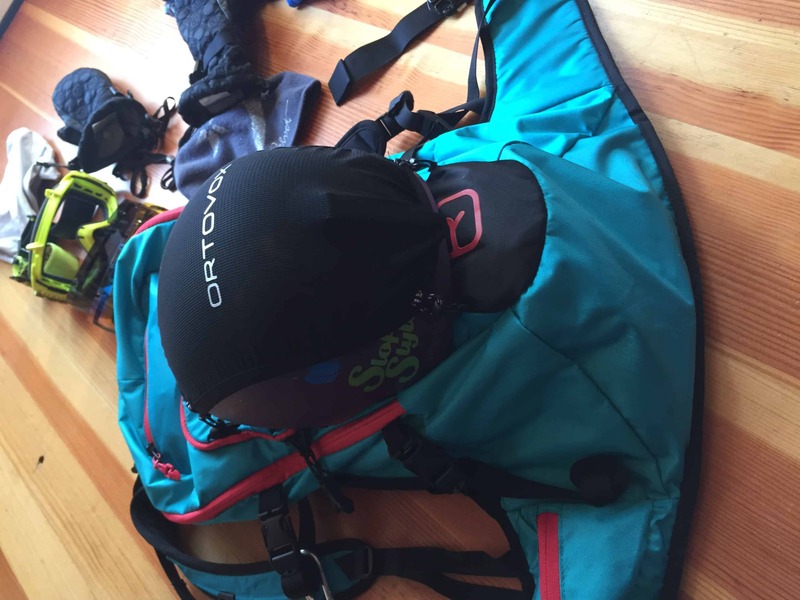 I loved the helmet fixation feature on the outside of the Ortovox Tour Rider 28 S – I know this is a standard feature on backcountry packs, but the previous pack I was using (which wasn’t made for backcountry riding) didn’t have this feature, and I am amazed at how much room it frees up inside the pack. That being said, when taking a shorter skin uphill, I occasionally keep my helmet on or put it inside the pack, rather than re-fastening the helmet pouch to the outside of the pack. However, given the amount of space inside the Ortovox Tour Rider 28 S, that totally works! 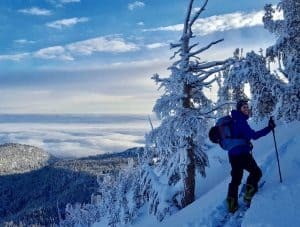 The external snowshoe/snowboard fastener is a nice touch; although I have a split board and hope to be skinning more than hiking, it’s good to know that if I have to take the board off, there’s a place to put it securely. 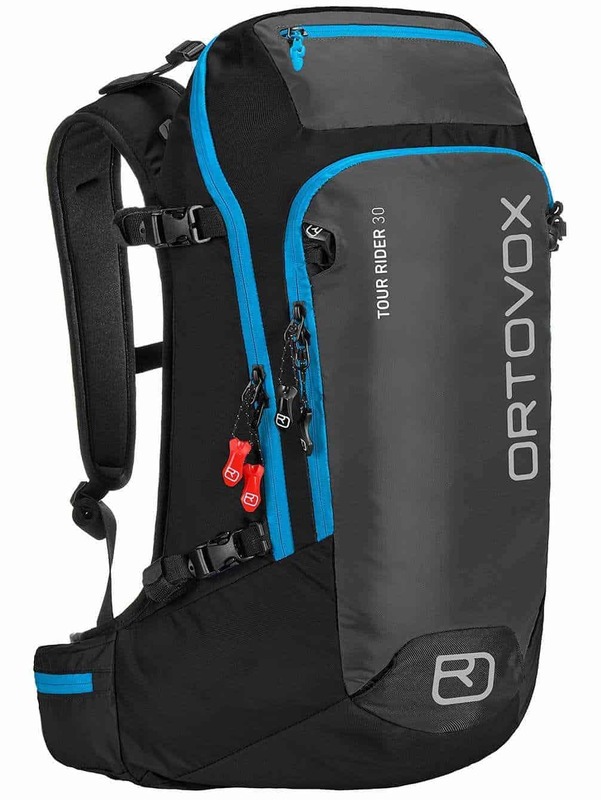 Ortovox seems to have put a lot of thought into the needs of backcountry users, and the Tour Rider 28 S has many great features based on this perspective including: ice axe and hiking pole attachment, ski fix (either to the side or diagonally), signal whistle on the chest strap, rope attachment, and a bright inside to better see your gear. The dream team! 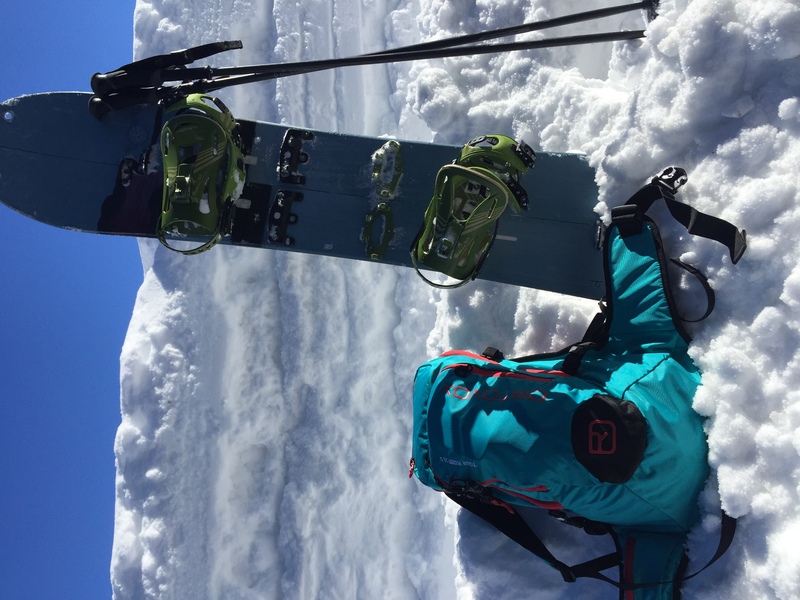 Split board, poles, and Ortovox Tour Rider 28 S enjoying a bluebird pow day. The strap that is meant to hold the shovel blade didn’t work well for me, even though I’m using an Ortovox shovel. The strap kept slipping down the shovel blade and didn’t remotely work to hold it in place. Beacon, shovel, probe, knowledge – #safetyfirst! Both sides of the pack include upper and lower straps, but it would be great if one of the sides had a lower pocket that could fit the base of a water bottle or thermos in. 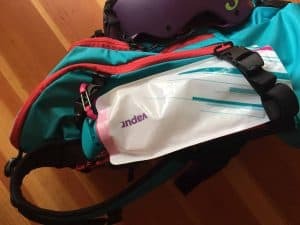 A minor issue I ran into was when I clipped a water bottle to the side of the pack and attempted to secure it with the bottom strap, it kept swinging freely at the bottom, which was slightly annoying. Side straps – not to be used to secure a water bottle. Incorporated hard case for sunglasses; it’s nice to know my shades will be protected for the skin up the next ridge! Separate pocket for my shovel blade, in order to keep my gear better organized and more accessible. Another pocket inside the main body of the pack would be nice for gear organization. So far so great! This pack is really comfortable, especially for a petite woman. I like the size as well; I tend to get cold and need lots of layers with me, so the 28 L of space provides enough room for all the gear I need (extra gloves and socks, first aid kit, skins, snacks, layers, etc.). 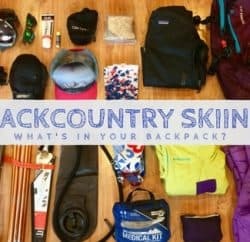 I am excited about many future days in the backcountry, and I know that this pack will facilitate those adventures. See you in the mountains! 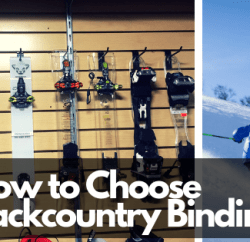 All products available at Tahoe Mountain Sports in Truckee. Here’s the men’s version of that pack: Ortovox Tour Rider 30 or check out the Haute Route 32 if you’re looking for more space and features. 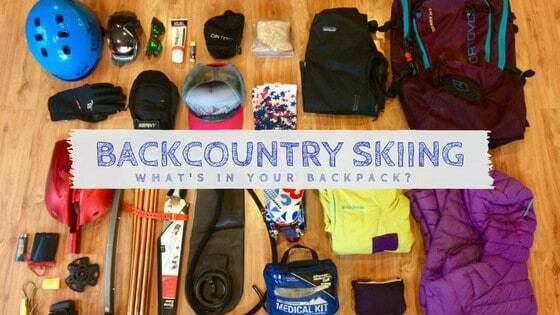 What’s in your Backcountry Backpack? 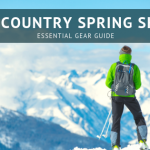 Click here for the gear list and see if you have all of these items.